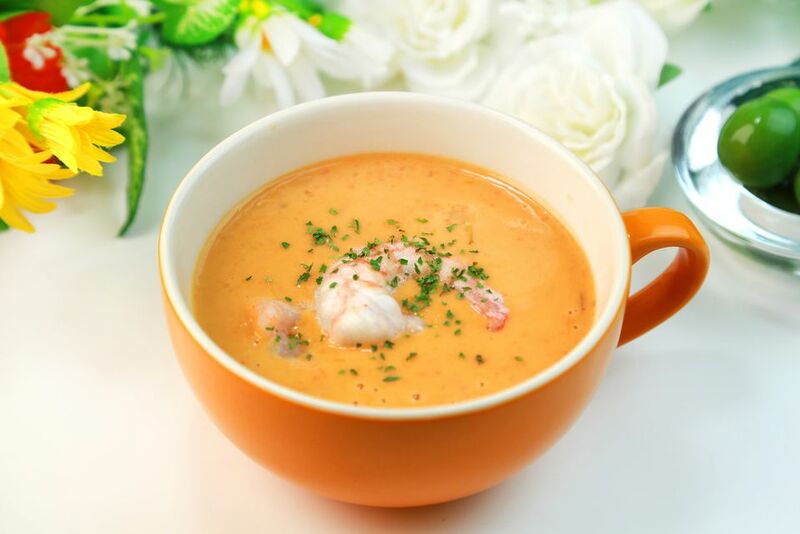 A bisque is a French style of soup that is made from crustaceans, such as lobster, crab, shrimp, and crayfish; their shells are used to make a stock and the meat is incorporated into the finished dish. So, in a way, calling the soup a "seafood bisque" is somewhat redundant. The main characteristic of a bisque is that it is smooth and has a velvety texture. Most recipes will include a wine and cream to give it its signature flavor and texture. But it's not merely the choice of ingredient that makes bisque different from other types of soups. It’s also the technique for utilizing that ingredient, including the parts you can't eat, making a bisque what it is. Authentic recipes for bisque actually ground the shells of the crustacean into a fine paste, using that to thicken the soup. Nowadays, it is more common to use rice as a thickener. In the more distant past, the word "bisque" encompassed soups made from quail or pigeon, sometimes with chunks of crayfish meat added. However, more recently in the culinary world, it has become quite common to see the word bisque used to describe any puréed soup, whether made from crustacean or vegetable, cream-based or thickened with roux. Butternut squash bisque, tomato bisque, and mushroom bisque are what we will most likely find on restaurant menus. Although a bisque and a chowder are both cream-based soups and most often feature seafood, it is their consistency that defines them and makes them quite different from each other. Whereas a bisque is smooth, a chowder is chunky, chock full of hearty pieces of ingredients such as potato and clams or corn. We also see bacon as an important ingredient in a chowder when it would not be featured in a bisque. Lobster bisque is one of the more popular versions of this soup and, if made in a traditional manner, requires several steps. The first is to make the stock. The shells of crustaceans happen to be loaded with flavor, but because they can't be eaten, alternative ways to extract that flavor, namely by roasting and then simmering them, came into being. To make a lobster bisque, begin by steaming a live lobster, saving the liquid you used to steam it. After removing the cooked meat from the lobster, the shells are drizzled with olive oil and roasted in a hot oven along with some aromatics like onions, carrots, and maybe fennel until everything is brown and toasty. The next step is to deglaze your roasting pan with something decadent like brandy or cognac, reduce, and then add the steaming liquid and simmer with a couple of bay leaves until it's reduced quite a bit. This will concentrate and intensify the flavor even further. Strain and use the resulting stock as the base for your bisque. Sometimes, bisque is thickened with rice and then puréed along with some or all of the meat. (Puréeing the meat heightens the flavor of the bisque and also helps with thickening.) There is also the option to purée half the meat, and reserve some of the larger chunks of tail and claw meat to add at the end. What Do Beef Labels Mean? Anaheim Peppers: Are They Really From Anaheim?